Preheat oven to 175°C/350°F. Grease tart pan with butter. Blend hazelnuts, flour, lemon zest, cinnamon, cloves, sugar, and salt in food processor until nuts are finely ground and ingredients are combined. Add butter and egg and pulse until a soft dough forms. Turn dough out onto a lightly floured surface and knead a couple of times until the dough is smooth. Reserve a third of the dough for the topping and press the remaining dough evenly into tart pan, making sure to press it up the sides and into corners. Spread jam over the dough evenly. On a lightly floured surface, roll remaining dough out until 0.5-cm/0.25-inch thick. 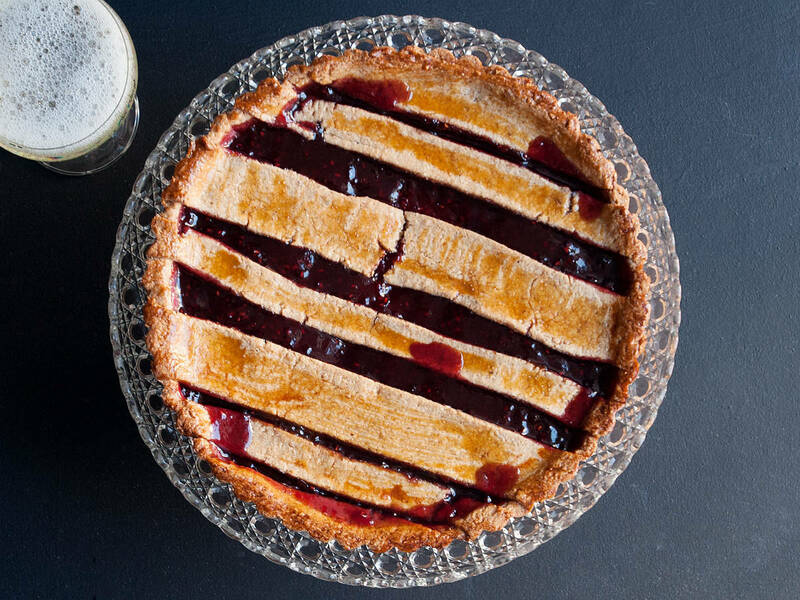 Cut strips of dough and arrange as a lattice or in any decorative pattern atop the jam. Mix together egg yolk with water until smooth. Brush crust with egg wash, then bake in preheated oven at 175°C/350°F for approx. 35 – 45 min., or until crust is golden brown and the jam is bubbling.